If the mounting assembly is leaking, you need correct mounting installation answers. If your newly installed InSinkErator disposal appears to be leaking, this 40-second video points out a few key areas to check and correct. If the mounting assembly is leaking, check to see if it's properly installed. Check that the mounting assembly is properly assembled. 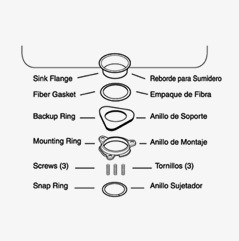 Ensure that the disposal locking ring is rotated fully to the right. Check the three screws making sure each is tight and secure. If this is a new installation, check under the sink flange for excessive plumber's putty. Remove the disposal, remove any excess plumber's putty, tighten the screws, remount the disposal and test for leaks again.